You can view a similar color picture of this scene I took last year. Other B&W pictures can be found at Aileni's home for Monochrome Maniacs. Nice contrast between the tall and the small, the dark water and the white sails. I can see some nice reflections! Very nice shot - I like the sails against skyscripers! Pure lines! Even the reflections are perfect! Another shot showing what a nice relaxed place Boston is. I think Cardiff looks a little like this today. I have to say how much I like 'Window'. Those sailboats just make that scene. I like this one so much in B&W, I don't think I want to look at the color! Just another slice of a great city. There is no end to them in Boston. Beautiful B & W. The tones are perfect. Have you been to Salem,is it spooky? In this case I'll absolutely go for the b & w - it had more "life". Great shot. 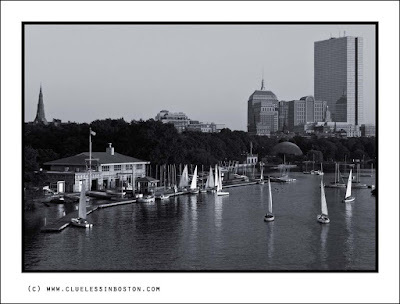 Love the sailboats on the water and the buildings of the city too. An idyllic afternoon on the Charles. That is a beautiful scene. Great B&W. I like the little white sails. Great mono - all those lines pointing upwards. Really good in blank and white. Really nice view and it looks great in mono. gorgeous composition. The sails and the skyscrapers and trees makes a nice scene. i like the monochrome. Thanks for your comments about the Glen Canyon dam and bridge. I am glad you liked them. For some reason I like heights and the views they bring. Last year we did the bridge climb at Sydney harbor. that was quite amazing. We were tied off.